Home FinTech Blockchain Is Ethereum the next big thing? This article first appeared in Personal Wealth, The Edge Malaysia Weekly, on August 7, 2017 – August 13, 2017. The world’s No 2 cryptocurrency has seen a spectacular price surge this year and broken above the US$400 mark. Industry players discuss the prospects for the digital token and what investors should look out for when buying into the alternative asset. The price of ether — the value token of the Ethereum blockchain — broke above the US$400 mark in June, marking a 5,000% increase from US$7.98 at the start of the year. This dramatic price growth takes place less than two years after the cryptocurrency was introduced, compared with its rival, bitcoin, which hit the US$400 mark only about five years into its existence. The gains, mainly due to the rising popularity of the Ethereum blockchain technology, which is considered to be more robust and versatile than that of bitcoin, has made the digital coin an attractive investment option. Ethereum is an open-source blockchain-based decentralised platform that runs “smart contracts”, or applications that run exactly as programmed. The flexibility of the smart contracts allows developers to write their own programmes and applications and pay for the computational resources needed in ether. According to cryptocurrency data website Coingecko, ether was trading at US$223.54 on Aug 2, giving it a market capitalisation of US$20.95 billion. The price growth was a result of multiple factors, including the formation of the Enterprise Ethereum Alliance (EEA) in February, says Mriganka Pattnaik, countries associate at Luno — a global digital currency company backed by investors such as South Africa-based Naspers. “Combined with the steady increase of initial coin offerings (ICOs) and the technical advantages of the Ethereum blockchain technology, this cryptocurrency has received immense global popularity this year. However, we cannot brush over the fact that it is very volatile. The cryptocurrency is barely two years old. There is no telling how it will perform in the next few months,” says Pattnaik. The EEA is the world’s largest open-source blockchain alliance to date, with more than 150 members. It comprises Fortune 500 companies from all major sectors, including JP Morgan Chase, Microsoft and Intel, as well as several governments and governmental agencies. The alliance is aimed at building, promoting and broadly supporting Ethereum-based technology, best practices, standards and reference architecture, known as EntEth 1.0. Matthew Tan, founder of block explorer and analytics platform Etherscan, says those who have not invested in the cryptocurrency should consider keeping at least one ether to get involved in the technology. Etherscan is backed by some of the largest blockchain companies in the world, including Coinbase and Digital Currency Group. 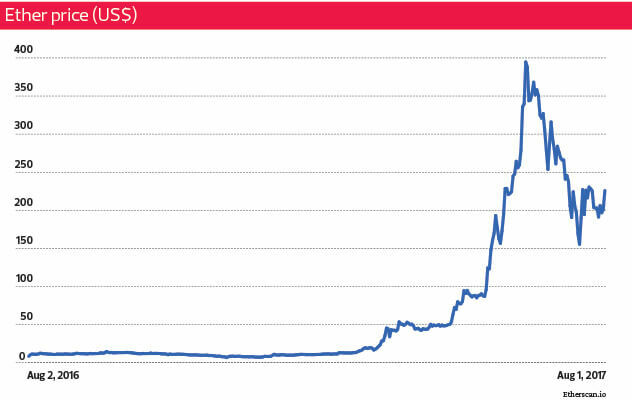 “It is not a bad idea to start investing now as the price of an ether is still less than RM1,000. However, unless you are a very smart trader, this investment should be held for at least six months or more,” says Tan. Bitcoin, the cryptocurrency with the largest market capitalisation, experienced a lot of volatility in recent months over a heavily anticipated fork event (see box). This affected the outlook and prices of other digital currencies. According to John Chan, co-founder and director of consultancy and software development company Crypto Securities (CrypSec), this could be a good time for investors to buy and hold ether until the dust settles towards the end of the year, provided that there are no more significant events such as the hacking of exchanges. CrypSec assists companies that wish to undertake initial coin offerings (ICOs), mining facilities and any legal or taxation issues related to cryptocurrencies. It also aims to push for the regulation of cryptocurrencies in Malaysia as a proper taxation and regulatory framework will attract significant foreign capital. Chan says the uncertainty over bitcoin’s future had tested the confidence in the entire cryptocurrency market as any fallout would be felt by all the players. “But if Ethereum continues to follow bitcoin’s trajectory, when it roars again, it may do so in a way we have never seen before because its bull runs have been longer than bitcoin’s, its downtrends far shorter and its price gains a lot higher. As the No 2 cryptocurrency, Ethereum has always been compared with bitcoin. There is even a growing number of investors who claim that ether has the ability to rival bitcoin’s price and market capitalisation. For example, Roger Arnold, chief economist at California-based ALM Advisors, wrote in 2014 that Ethereum would be a game changer in the cryptocurrency universe. In May, he wrote that he continued to believe that the Ethereum technology would displace bitcoin entirely. Other prominent early investors of ether include Mike Novogratz, a billionaire and former hedge fund manager at Fortress Investment Group, and Fred Wilson, a venture capitalist and co-founder of Union Square Ventures. However, there are many differences between Ethereum and bitcoin. For one, there is no anonymous persona behind the creation of Ethereum. A white paper was written by Vitalik Buterin in 2013. The Russian-Canadian discovered bitcoin in 2011, when he was 17 years old. He was interested in the underlying technology and co-founded an online publication, Bitcoin Magazine, that year. As he got more involved in the cryptocurrency, Buterin dropped out of university in 2013 to focus on various cryptocurrency projects, which led to the creation of Ethereum. The Ethereum system went live on July 30, 2015, with 11.9 million pre-mined digital coins for crowdsale buyers. The most prominent difference between bitcoin and Ethereum is the latter’s smart contract technology, which has been leveraged by developers to come up with applications for personal finance, gambling and P2P services. According to Ian Chin, co-founder and director of CrypSec, the smart contracts have formed the basis of ICOs, which recently became a popular way for companies to raise funds. “Two years ago, Ethereum or any other cryptocurrency really did not have any significant real-world applications. However, this year, many tech companies have launched coins and tokens that either already have real-world applications or promise to deliver such in the next few years,” says Chin. TenX, a Singapore-based company and graduate of PayPal’s incubator programme, had a successful ICO recently where it managed to raise more than RM150 million in just seven minutes and RM300 million in two weeks. The company has created a physical cryptocurrency debit card that is accepted at outlets using Visa and MasterCard terminals. On Aug 1, the Monetary Authority of Singapore said ICOs would be regulated if the digital tokens are deemed to be products covered by the Securities and Futures Act. This announcement was made in the wake of the recent increase in the number of token offerings in the city state as a means of raising funds. There are also many technical differences between Ethereum and bitcoin, including its flexibility, difference in block time, economic model and method for costing transactions. Luno’s Pattnaik explains that the block time (the time it takes for a transaction to receive network confirmation) for Ethereum is about 15 seconds, compared with bitcoin’s 10 minutes. Also, Ethereum rewards its miners the same amount each year while bitcoin reduces its reward by half every four years. 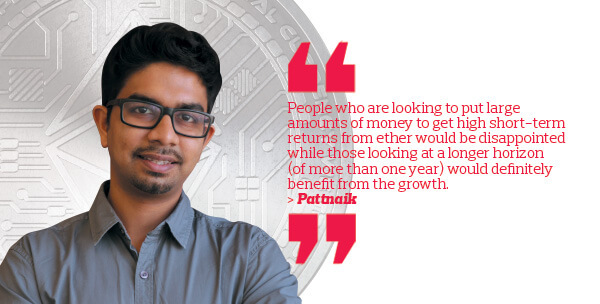 Pattnaik says it is difficult to say whether Ethereum will overtake bitcoin as it is still early days for the cryptocurrency industry. “There are two key factors in favour of bitcoin over Ethereum. One is that bitcoin is deflationary in nature — there is only a fixed supply of bitcoin — which favours its use as ‘digital gold’, whereas ether does not have a fixed supply. The two cryptocurrencies have different methods of costing transactions. While bitcoin’s transactions are based on the transaction size, Ethereum’s transactions depend on the computational complexity, bandwidth use and storage needs. Ethereum is now having issues with scaling, which bitcoin experienced earlier. Referring to the tracking of information on transactions over the past few months, Tan says Ethereum’s blockchain is getting congested. “The problem is acknowledged by the Ethereum community. There are short-term fixes, similar to bitcoin’s increase in block size,” he says. The backlog issue was not unforeseeable, says Chan. According to him, Buterin had planned from the start to have different iterations of Ethereum rolled out until the full release, with each iteration adding upgrades to the network to minimise the possibility of a critical bug that could be catastrophic to the network. “We are currently at the ‘Homestead’ version of Ethereum. By the end of the year, the ‘Metropolis’ version will be released, bringing with it many improvements. The most notable will be an upgrade to its scalability,” says Chan. Ethereum is known to be very volatile, with a few events managing to shake the entire ecosystem. The most prominent has been the hacking of a decentralised autonomous organisation (DAO) — an experimental project that was touted as the most successful crowdfunding venture. Despite raising US$160 million worth of ether on June 17 last year, a hacker managed to siphon off 3.6 million of the digital coin. This caused the price per ether to fall from US$21.50 to less than US$13 in a matter of hours. However, the funds are stuck and cannot be used in transactions for another nine days (due to the DAO’s 28-day funding window), leading to a debate in the Ethereum community on how to solve the problem. A vote was held and the majority of the participants agreed to a hard fork, where Ethereum’s code would be changed to give refunds to investors and move away from the hacker. This resulted in a split — Ethereum and Ethereum Classic. There continues to be a rivalry between the two networks. As at July 26, Ethereum Classic was trading at US$14.68, giving the cryptocurrency a market capitalisation of US$1.3 trillion and a trading volume of US$72 million. The attacks, however, did not end. Ethereum subsequently forked two more times in the fourth quarter of last year to deal with the other attacks it suffered. On June 21, cryptocurrency exchanges GDAX collapsed due to a flash crash that saw the price of ether fall to 10 US cents from more than US$300 for a few milliseconds. This caused jitters in the market and the price of ether plunged to US$253.68 on June 26. Pattnaik says the flash crash was caused by a multimillion-dollar sell order — a huge one for Ethereum — which was executed. “As the liquidity of ether was limited on the exchange, this led to something called slippage, which led to the price plummeting as a lot of traders had placed automatically triggered stop loss orders. In the evolving cryptocurrency industry, it is a valuable lesson for all exchanges so that there are checks and balances to ensure that such incidents do not occur again,” he says. The flash crash was followed by mega ICOs, which raised more than one million ether in 19 days. But anxious traders who were concerned that Ethereum was growing too fast started to cash out of the cryptocurrency, leading to a further decline in prices. Despite being less than two years old, Ethereum is infamous for experiments using smart contracts to implement Ponzi schemes. A study by the University of Cagliari in Italy found that about 10% of the 1,384 smart contracts with verified source code on Etherscan were Ponzi schemes, although only about 0.05% of the transactions on the Ethereum blockchain are related to Ponzi schemes. There are currently two companies on Bank Negara Malaysia’s watch list involved in Ethereum — Ethtrade Limited and Ethtrade Malaysia. Pattnaik says there are a few red flags that investors should look out for to protect themselves from Ethereum-related scams. “A lot of these schemes ask investors to give them their coins in exchange for guaranteed absolute returns of more than 20% to 30% in the next few months. This should be a huge red flag as it is inaccurate — no one can guarantee this in cryptocurrency, especially if they do not highlight the high risks involved,” he says. Other things that investors should be wary of are organisations trying to manipulate the market. According to Chin, there are many big investors who hide behind anonymous veils and conduct fear or doubt campaigns to try and shake market confidence in an attempt to buy low and sell high. There are also a few well-coordinated “pump and dump” groups. These groups of traders work with each other to raise the price of certain digital coins for the purpose of dumping them later to turn a profit. “Investors should always take their securities seriously. Leaving their cryptocurrencies in exchanges and other ‘hot wallets’ may be convenient, but it exposes them to the risk of hacking, insolvency of the exchange and theft,” says Chin. “The cryptocurrency you own is not truly yours unless you are in control of your own private keys. We always advise our clients to keep their holdings in wallets like MyEtherWallet or in ‘cold wallets’ such as the Nano Ledger S, where you retain full control of your wallet. Hot wallets maintain active connection to the internet and cryptocurrency network while cold wallets are used for offline storage. If there is no connection between the wallet and the internet, hackers will not be able to steal funds. Therefore, users of hot wallets typically only store minimal funds. Luno’s cryptocurrency wallet has both a hot wallet and cold storage. It keeps the majority of the bitcoins in cold storage to keep them secure and regularly tops up the hot wallet so that users can use cryptocurrency. According to Pattnaik, users will be able to store Ethereum in the wallet by the end of the year. Due to the popularity of bitcoin and Ethereum, some investors have been investing in alternative cryptocurrencies (altcoins), hoping that they will achieve similar success. However, investors should avoid the smaller altcoins and stick to the better-known cryptocurrencies such as bitcoin and ether, says Tan. “This depends on the investors’ risk appetite. If they are willing to spend on the smaller coins, then be prepared to lose the investment. It is possible for you to get up to 10, 20 or even 100 times your initial investment down the road, but the risk of your investment going to zero is also very high. Whereas if you invest in the bigger coins, if you hold them long enough, eventually you will be able to get back at least your capital,” he adds. “Of course, if you know what you are doing, then it is a good idea to put your money in different baskets of currencies. But I believe investors in Malaysia have not reached that level of maturity yet, and the market is manipulative,” says Tan. In Malaysia, investors can buy ether using bitcoin at popular exchanges, such as ShapeShift and Poloniex, and keep the digital coin in the exchanges’ hot wallets. For added security, investors can create desktop wallets, such as Exodus, or purchase hardware wallets such as Trezor that store their private keys in a secure device. Once investors have the address for both wallets, they can deposit their bitcoin to receive ether, which will be stored in their Ethereum wallet. The transaction cost differs for each platform. Poloniex’s fees, for example, range from 0% to 0.25% depending on the trade volume while ShapeShift only charges a miner fee (0.005 ether at time of writing). Bitcoin blocks are currently limited in the number of transactions they can process as they can only handle up to 1MB of transactions roughly every 10 minutes. To increase the number of transactions, bitcoin miners came up with several proposals. On July 21, the majority of them supported what was known as SegWit2x. Following the decision, the segregated witness (SegWit) code optimisation is being adopted by key players. This will change how data is stored on the network. Later, the block size will be increased to 2MB. On Aug 1, a rival system called Bitcoin Cash was launched. Its block size is 8MB and it keeps data in the block. This bitcoin fork is expected to increase volatility in the cryptocurrency market.